Growing Tomatoes from seed is easy. You can also purchase seedlings from local nurseries and get an even faster start. Tomatoes need plenty of room and full sun. There are two types of Tomatoes, determinate and indeterminate. Determinate types are bushier and more compact than indeterminate types. Determinates are better suited to smaller growing areas. Indeterminate types have sprawling vines and need support. Tomatoes are heavy feeders, so it's important to make sure there's plenty of compost mixed into the growing area. When transplanting your young Tomato plants bury them deeper than the previous soil level. Planting your Tomatoes deeper encourages healthily initial growth and stronger plants. 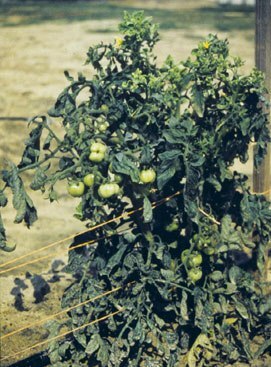 Tomatoes are very sensitive to too much water or too little. It's important to not allow the soil to dry out or keep it too wet. Caution: When growing Tomatoes always remind yourself - they do not like their leaves wet. 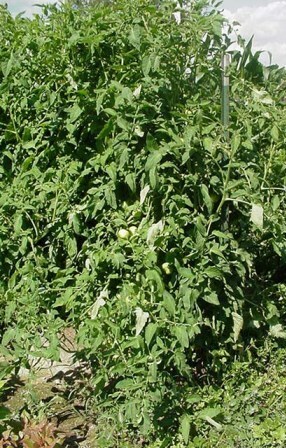 To prevent diseases, water only the soil below and around your Tomato plants. Diseases: Bacterial Canker, Bacterial Speck, Bacterial Spot, Blossom End Rot, Early Tomato Blight, Gray Leaf Spot, Late Tomato Blight, Septoria Leaf Spot, Southern Blight, Spotted Wilt Virus, Tomato Anthracnose, Tomato Mosaic, Verticillium Wilt.